Stacey is nurturing, loving and supportive and has such a passion and love for Kinesiology and helping others. She is a registered and qualified Level 4 Kinesiologist with the Australian Kinesiology Association (AKA). After spending well over a decade in the corporate world as an Executive Assistant she found that she was completely burnt out and physically and emotionally exhausted. This burn out further escalated after having her beautiful daughter with the combination of motherhood, travel, pressure and the unrealistic expectations she placed on herself. She finally found an opportunity to step away from her high flying career and into a health orientated part-time position as the Administration/Marketing Assistant for Denise Robinson at By The Bay Kinesiology. This position enabled her to work around her families schedule and gave her the work life balance that she was so desperately craving. Little did she know that her new job would end up changing her life path forever and enable her to follow her dreams and now be a Kinesiologist! After having her very first Kinesiology session with Denise and then attending her Kineasy Intro. Course, as part of the position requirements, she immediately realised that this is exactly what she wanted to do with her future. She continued to study many different Kinesiology courses and be mentored by Denise and now is excited to be fulfilling her dream and assisting others to do the same as a Qualified Kinesiology Practitioner. Stacey is a natural at tapping into your potential and desires, building self-esteem and confidence and assisting you to break cycles and achieve the very best out of your life. Throughout her own life’s journey she has experienced some devastating, traumatic and life altering challenges and obstacles and yet her inner strength in surviving and eventually thriving after all of these is one of the things that she is most proud of. 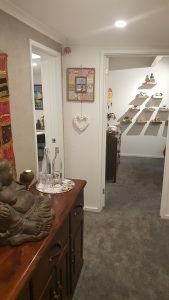 Stacey understands that her clients are on their own journey, some need compassion, understanding and time to process and heal whilst others are not ready to go deep and just need to work on one particular stress at that time. She is always guided by her client as to how they would like to run their session, as their healing is their own responsibility, and she is there to guide and support you. Stacey’s love of Kinesiology brings together her love of crystals, essential oils and other healing remedies into a way that can help shift unwanted emotions and bring peace and calm to people. Throughout her journey she has been able to witness some amazing transformations in people, and she has been able to grow, change and accept some of the more challenging parts of life which is why she is so passionate about this amazing modality. Her passion in life has always been connecting to, nurturing and empowering people who may be feeling down, worthless, lost and without a way forward. Stacey’s key strengths lie in her ability to easily connect to people and accept them for who they are, she allows people the space that they need to express and work through their emotions and understand that everyone’s journey is different. She genuinely cares for all those around her which is why she particularly loves working with both adults and children who may be struggling with self-confidence issues, motivation, relationship issues, learning difficulties and other physical and emotional issues. Stacey is excited to warmly welcome you to join her for a Kinesiology session to begin or continue on your healing journey. The infinite possibilities inside you are what make you unique. She is excited to have the opportunity to be able to help you tap into your own potential and watch you grow, change and thrive as nature intended. Included in the session fee are flower essences if required. To book an appointment time with Stacey Wilson please click on the button below to be directed to our online ‘Appointment Booking Request Form’.